I wasn't expecting to take a blogging hiatus, but it happened. And I can honestly say I didn't miss coming up with posts. Life has been crazy. The last two weeks have been an absolute blur. Normally I'd feel guilty about taking a break but I don't. Blogging was becoming a chore and I didn't want that. I want to come to this space excited and ready to write. And after all, what would be the point of writing a lackluster to post only to waste your time time and mine? +If we were on a coffee date I'd bust out to tell you that I'm going home (again) this weekend. It couldn't be more perfect timing. +If we were on a coffee date I'd tell that it's been a year to the day that my Grandpa passed away. It's just weird and feels like an eternity since I've seen him. Then I'd probably get a lump in my throat thinking of all the memories. I'd quickly ask what's going on in your world just to change the topic. +If we were on a coffee date I'd tell you that I'm having a really hard season. I can't even explain what's going on. A MAJOR funk that I can't get out of. Maybe even shed a few tears. But don't worry- I won't get too emotional on ya. Save that for another time and place! +If we were on a coffee date I'd tell you that I have the holiday decorating bug already. I understand I should be decorating for Halloween but if you know something about me, I hate Halloween. I'll pass on the haunted houses and everything scary. Bring on Thanksgiving and Christmas!! 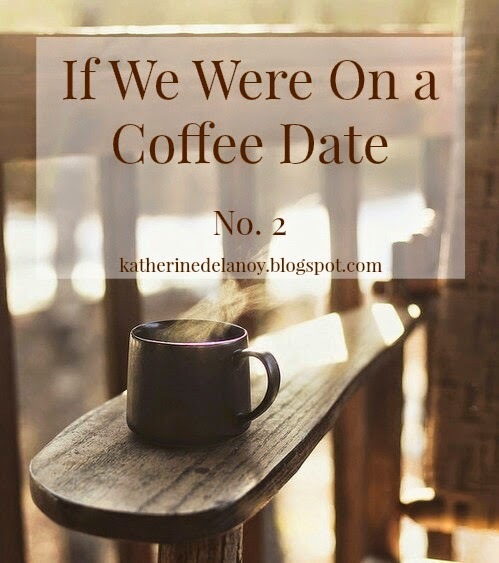 +If we were on a coffee date I'd tell you that I need "Kate Time" to feel rested, relaxed, and rejuvenated. To go somewhere or be with people who can get me back to my happy place. +If we were on a coffee date I'd tell you I can't wait to have my own apartment because living with a constantly sloppy roommate doesn't make this clean freak happy at all. Or maybe it's secretly so I can finally decorate how I want...duh! +If we were on a coffee date I'd look at my watch and be surprise how quickly two hours had passed! And then tell you how much I appreciate you- over and over. I'd thank you for listening to me while I poured my heart out in the tiny corner of our local coffee shop If we were on a coffee date what would you share? Linking up with Annie and Nat for another week of Thoughts for Thursday! I love the idea of this post...what a fun way to do updates. I've done the non-scheduled hiatuses too...sometimes you just need a mental breather! Hey, if you need a break from blogging, take it! This space should be a fun place, not another "chore" you have to do. Lately I've been taking mini breaks because of stuff going on and it's just what I've needed.